Alano Edzerza belongs to the Raven clan of the Tahltan Nation. Born in 1981, he has been an artist since he could hold a pencil; and received his first recognition of merit at age thirteen for a sculpture award from the school board of Victoria. This early talent developed rapidly into a professional career with an international gallery and museum shows. 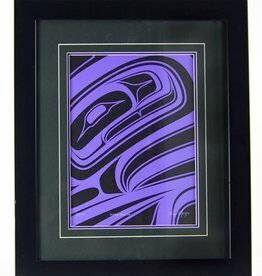 Alano began working in Northwest Coast art under the tutelage of his family member, fellow Tahltan artist, Terrance Campbell. In 2002 Alano furthered his education by attending school in Arizona for jewelry making under the instruction of Rick Charlie. He has also had the opportunity to work with artists Jay Simeon, Marcel Russ, Philip Grey, Corey Bulpitt and Rick Adkins. Today Alano is a Tahltan multimedia artist and entrepreneur based in West Vancouver, British Columbia. He has had numerous group shows and solo shows in Canada and abroad and is one of the key artists in the contemporary Northwest Coast Art movement. He grew up in Terrace, Victoria and Vancouver and has been involved in artistic endeavors since an early age. He first learned about his Tahltan carving tradition from members of his family; in particular, Terrence Campbell. He received his first award for sculpture from the Victoria School Board at the age of 13.